When you’re living the un-slow life, you’re living for the future, living for some goal up ahead that you will never reach. And in this way, you are putting yourself at odds with the present, which only strips more power from you. Happiness and fulfillment become delayed. Unattainable. Stranded out there in the foreign future. Accordingly, burnout occurs. The more stress and less fulfillment that comes with this way of life, the harder the treadmill runner will push herself to get to that distant future and the relief it brings. In this state, it’s easy to struggle with others, too, which of course makes life harder and happiness feel even further away. Frequently, you fight with co-workers, children, parents, siblings, and bosses. Then you may find yourself harboring resentments for anyone that slows your headlong rush toward future success and the happiness associated with it. When unmanaged, these brushes with others, then, can turn into sores and lingering wounds that worsen with time. In the treadmill life, there is no time to slow down and handle the present. There is no time to relax when serenity and peace and success are so far off. Fearful questions and disempowering beliefs lodge at the back of the mind, unconsciously urging for more action. Even the thought of changing our approach to life seems scary and holds us hostage. “What would I be, if I weren’t living this way? Would I still achieve my goals?” “What will happen if I actually change my approach to life? Will I want to leave my job or my partner? Will my partner want to leave me? And then what? What if I actually find happiness? Some of us even have this question lurking around, a question that creates so much discomfort it compels us to dive deeper into the distraction of more work: “Do I even deserve success?” Truth be told, when I began learning to slow down, I did see that there was a lot I had to address. I learned that much of my trouble came from the way I related to the world and the beliefs that I held about the world and the people in it. I learned that I was trying to fit into a corporate culture using character traits that didn’t suit me or feel good to me. I was living someone else’s notion of success and happiness. Simply put, I believed I was at the mercy of the world and the people around me. I didn’t see that I actually had many choices. I didn’t see how I could really question and challenge my beliefs. How I could shift the way I was seeing the world. And I then began to discover that happiness is already inside me… it was just covered up by all the beliefs I had piled on over many years that led me down the path of believing it was somewhere else. 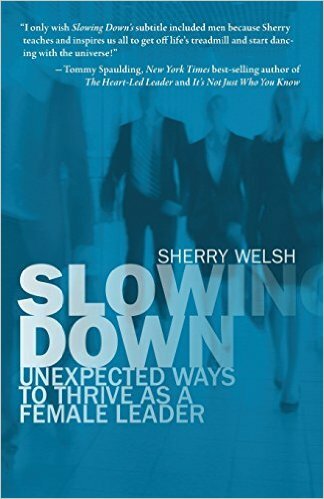 This discovery of the slowed down life, the digging into the present moment to find happiness, true success, and freedom–that is the point of this book. To reveal to you the ways that happiness and joy and ownership have entered my life and the lives of my clients as a result of slowing down, questioning beliefs to gain clarity, moving from a place of victimhood to empowerment, and ultimately finding that state of peace and fulfillment that I know exists in us all. Buy Now!